Mount Everest is still the ultimate mountaineering adventure. As one of the Seven Summits and also the highest mountain in the world, Everest has immense appeal to mountaineers and fascination for non-climbers. There is additional allure because of its position in Nepal's Khumbu, one of the world's most beautiful mountain regions, and because of its remarkable climbing history. An ascent of Everest provides immense personal challenge, a rewarding cultural experiences, and a personal connection with a rich history of exploration. An attempt on Everest is also a major undertaking which requires significant climbing experience, solid alpine skills, good mountain judgment, excellent physical conditioning, and a huge amount of dedication and determination. If you see Everest as a definite or even possible climbing goal for yourself, we can help you through all the stages of your preparation, from technical skills development to training in cold weather survival skills and gaining high altitude climbing experience. Which route? North or South? The South Col route from Nepal offers the best chance of success for most climbers. High royalty fees by the Nepalese government have created a large disparity between the costs of Everest expeditions from Nepal and Tibet. It is well worth your time to research details about both sides of the mountain. People will argue the virtues of either approach. However, we maintain that the ‘entire package’ of the Nepal side makes it the preferred option: the delightful approach through the Sherpa homelands via the Khumbu valley, enjoying Sherpa hospitality in modern lodges with good food, and all the while being impressed by the spectacular scenery of the incredible peaks of the lower Khumbu. 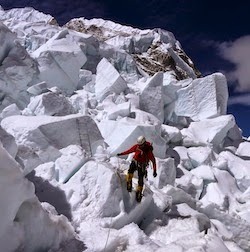 The Khumbu icefall has a fearsome reputation and is indeed a phenomenal route to climb. Yet it is an integral characteristic of the south side that it is a ‘climbers route’, which means it requires a mountaineer to be well skilled in the use of crampons and ice axe. By the time you first arrive at Base Camp at the foot of the Khumbu Icefall, a route will already be established with ropes and ladders through to Camp 1. Sherpa teams will be busily involved in ferrying loads of equipment up the mountain. After a few days acclimatization at Base Camp, you will climb through the Icefall to Camp 1 and rest for a day. The following day you will continue up the more gentle slopes of the Western Cwm to Camp 2 to rest and acclimatize for several more days. A day-climb up the Lhotse Face towards Camp 3 will complete this first foray before returning to Base Camp. During this time the guides and Sherpa climbers will be establishing the higher camps and stocking these with bottled oxygen for the summit climb. The Western Cwm is renowned for the phenomenal views of Lhotse, Nuptse, Pumori and Cho Oyu and our Camp 2 is situated directly beneath the imposing black hulk of the notorious Southwest face. As one climbs higher up the route to South Col, the views become even more outstanding with incredible vistas along the Himalayan mountain range and out towards the lowlands of Nepal. We ascend 900m from the South Col on summit day via moderate snow slopes with the occasional rock step to climb over. Approaching the South Summit as dawn breaks reveals astounding views from Kanchenjunga in the east to Shishapangma off to the west with all the peaks of the Khumbu well below us. The traverse along the summit ridge is exposed and exciting. When we make our way up the Hillary step you can look 2,400m straight down onto our Camp 2 in the Western CWM and 3000m down the opposite side of the ridge into Tibet! The summit itself provides ample space for the obligatory summit photo and is a time to reflect on the journey thus far. For many it is one of the most memorable moments of a lifetime. Big smiles on the summit of Everest! After the summit we descend via the same route, losing height quickly and generally arrive back at the South Col about 3-4 hours after leaving the summit. On the north side climbers must do a long traverse and it is this feature where climbers cannot lose elevation quickly that can cause the demise of tired climbers, especially those who have run out of oxygen. Climbs on Everest are during the spring season because the weather becomes progressively warmer and the days longer. Winter winds have already scoured away much of the snow, which significantly reduces the snow avalanche hazard as well. Contrast this with the fall where as the expedition goes on, the days get shorter and colder with more snowfall. Consequently very few expeditions are undertaken in the fall and those that do have a low chance of success. The South Col route on Mount Everest is not an especially technically difficult climb - nor is it the "Yak Route" as some non-Everest climbers have termed it. However, it is imperative that expedition members are well versed in the latest techniques and have experience in the high mountain environment. Climbers high on the slopes of Everest. What most photographs do not show are the difficulties of operating at the extreme high altitudes. It is a physically demanding ascent, requiring enormous determination and stamina. An expedition to Everest is not a place for those who will give up when the going gets uncomfortable or strenuous. Days can be up to 15 hours long and although you will have lightened the loads you personally carry by having enough Sherpa support to carry your equipment, the days are still arduous and taxing, especially over the 7-9 weeks of the expedition. The outcome of the expedition will be determined by three broad groups of factors. The first is environmental (weather and snow conditions, etc). The second is the logistical approach taken by the expedition leaders and the strategies employed to embark on a summit bid. The third is your own preparation in the years prior to the expedition and how you perform while the expedition is under way. We can help design a training program that will both physically and mentally prepare you for the climb, but you need to commit the time and energy to ensure you attain the correct conditioning. Our Everest expeditions run every year from April 1 to June 2. Whether you're just starting out with a Seven Summits goal or you're in the decision process of committing to an Everest climb, feel free to contact us for more information and advice on how to make your dreams come true! 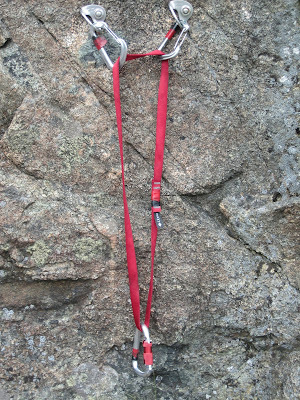 Most climbers begin their career by toproping. If you're reading this blog, it's likely that you've toproped before. So I'd like to try something new with this blog. I'd like to ask each of you out there in the dark corridors of the internets what you see wrong with each of the set-ups in the following pictures. Picture #1 -- This first photo was taken at Barney's Rubble in Leavenworth. What's wrong with this picture? Picture #2 -- This second picture was taken at the top of a sport route on the Aquifer Wall in Red Rock Canyon. What's wrong with this picture? Picture #3 -- This last picture was taken at the top of a route at Mount Erie. What's wrong with this picture? The rope is going through a single quickdraw. This is not what is considered industry standard. There should be redundancy at the power-point. Most often, the redundancy is reached by using two opposite and opposed lockers or three opposite and opposed non-lockers. The entire system is an massive Magic X or Sliding X. If your goal is to build an anchor that meets the standards of the anchor building acronyms SRENE or ERNEST, then an open Sliding X is the wrong choice. The problem with a large open "self-equalizing" system is twofold. First, there is the potential for a shock-load if one of the pieces fail. And second, there is no redundancy in the sling. If you need some level of self-equalization, the best thing to do is to add load limiting knots to the system. 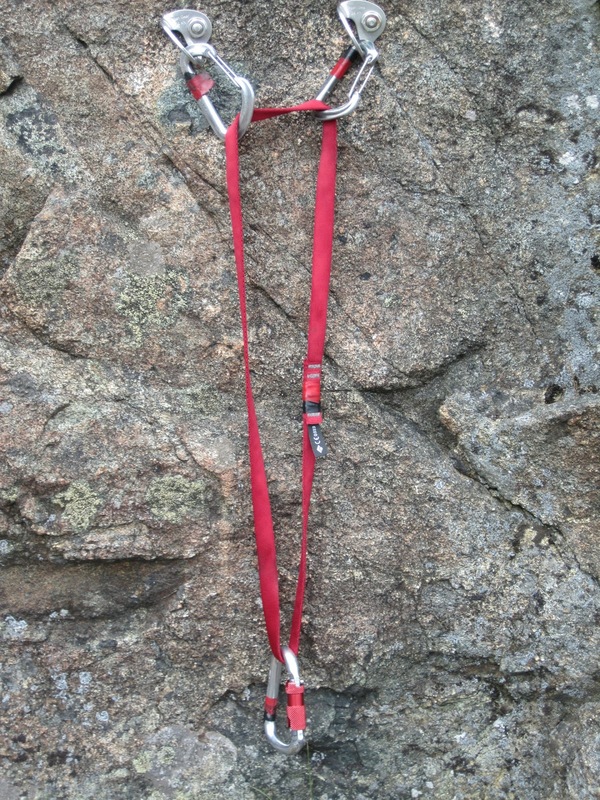 Load limiters will decrease the shock-load while creating redundancy in the sling. It's not at all clear what the sling on the right is for. Some people might believe that there should be two locking carabiners into the bolts. I don't believe this to be necessary. As there are two bolts, and a carabiner into each bolt, there is redundancy. One should not directly toprope off of chains. The constant lowering motion of the rope slowly damages the anchor. It is best to toprope directly off of your own gear and then to rappel with the ropes through the chains. Yep, that's an American Death Triangle, which means it's bad. There are dangerous vectors between the two bolts, and there is no redundancy in the system. In a toproped setting, the power-point should have at least two opposite and opposed locking carabiners or three opposite and opposed non-locking carabiners. 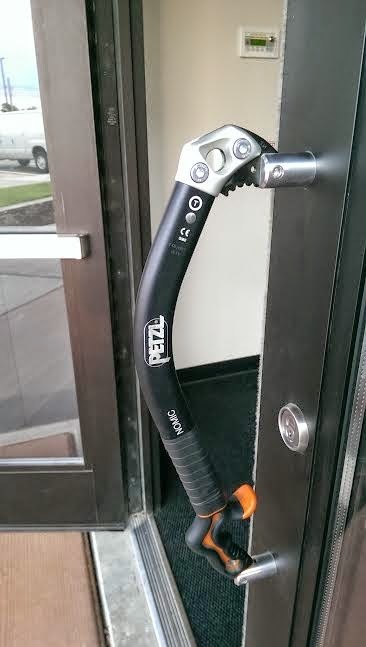 Like Picture #1, some people have stated that they would put locking carabiners into the bolts. I don't believe this to be necessary. As there are two bolts, and a carabiner into each bolt, there is redundancy. The history of climbing in the Yosemite valley is artfully documented in the latest project from Sender Films. Valley Uprising has already gotten a lot of attention as it has started to make its rounds through the festival circuit. So here's a little scenario that is all too familiar to some of us: You've graduated from college, you've got that magic piece of paper, and now your working that dream job, right? Oh, wait... you mean that dream job isn't all its cracked up to be? But somewhere along the way you've found something you are truly passionate about. "Waste" is a short from Handman Productions and the good folks at Mountain Athlete - you know, that little "gym" in Jackson Hole that has a nasty habit of turning ski bums into ski mutants, and dirtbag climbers into hard men and women! They take a look at a few of their athletes who have traded a "normal life" for the chance to chase their dreams of becoming pro skiers. The Monster Factory- Episode 1: Waste from Handman Productions on Vimeo. I bet most climbers are a bit anxious about their first real big wall experience. Do we have enough food and water? Did we bring the right gear? How long will it take? Are we bringing too much? It is easy to get bogged down by the uncertainty. However, if you have as much fun as it looks like Rab athletes Jacob Cook and Bronwyn Hodgins did on their first climb of the Nose, all those worries should quickly melt away! The Nose from Jacob Cook on Vimeo. Adventure photographer Krystle Wright shares her thoughts about the risks of putting her body on the line for the lifestyle and job she loves, and joy she gets from the experience of meeting new people and capturing the fleeting moments that encapsulate the soul of a place. I think her sentiments ring true for many of us in the climbing world as well. Graham Zimmerman talks about his personal progression, in both his training and his climbing, leading up to his climb of the old Fred Beckey project "Titanic" with partner Clint Helander in Alaska's Revelation Range. There are a lot of different theories about layering systems. And most of them have some basis in reality. It is important for climbers to look at what others are doing and develop a system that works for them. The idea behind a layering system is that you start at the base, with some type of synthetic long underwear. Most will wear Schoeller or nylon pants on top of this for their legs and then finish with a shell layer. The upper body is much the same. After the long underwear, the next level will be some kind of mid-layer. This is often a fleece. Most guides currently use the Patagonia R1 for this layer, but there are many options. After the middle layer, things become far more "system-based." By system-based, I mean that it depends on what you build the rest of your layering system out of. Personally, I carry another light fleece layer, a Patagonia Houdini, a Patagonia Micro Puff, and a Rab Super Dru Jacket for a shell. It may seem like I'm promoting Patagonia with this particular article, but that's not the case. These are items that work for me in my system. Other things may work for you in your system. The following video describes another concept of layering. It is a good demonstration that was developed by a European gear shop. The video is very hard on cotton. And while cotton has it's problems, there are many advantages to it as well. Cotton works extremely well in warm environments. If you are going to climb in the desert or you believe that you will have a warm alpine ascent, then it is well-worth bringing a cotton t-shirt along. The same properties that make cotton dangerous in cold and wet environments, make it an excellent option for warmer and dryer climates. That said, if you elect to bring cotton on a trip and the weather turns for the worst, it is important to have an array of high tech clothes that will deal better with such a circumstance. 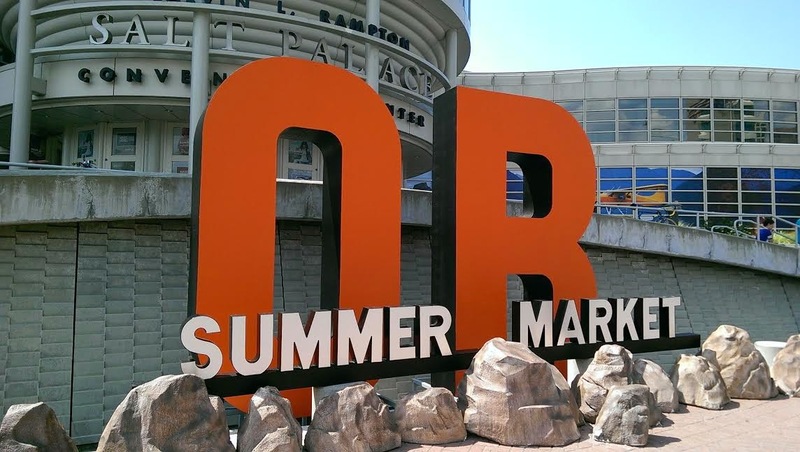 The Outdoor Retailer Show is the largest trade show of its kind in the US. Housed in the Salt Lake City Salt Palace, the show spans an amazing 820,000 square feet of floor space and hosts over 1,400 vendors and 25,000+ total attendees. 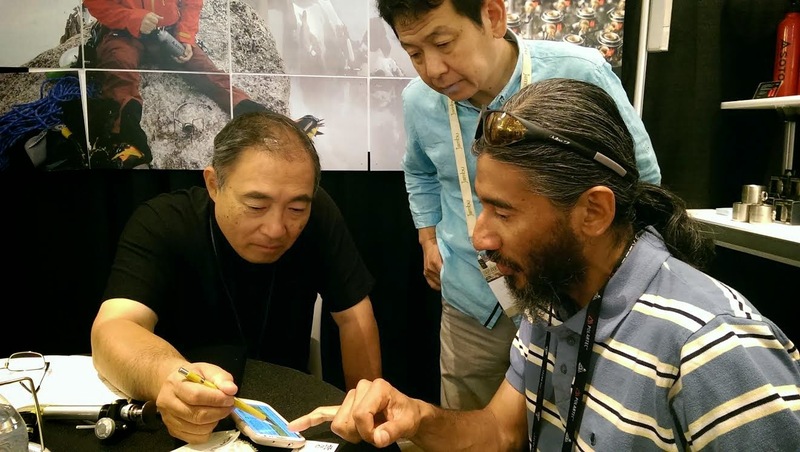 The American Alpine Institute attends the OR Show to preview new product for the next spring and summer seasons for its retail shop and program equipment needs. We also present the annual Guides Choice Awards to the manufacturers of gear that our guides have reviewed and voted on as being gear that is innovative, durable, functional and of excellent quality. AAI Director Dunham Gooding for the Tricam Evo. 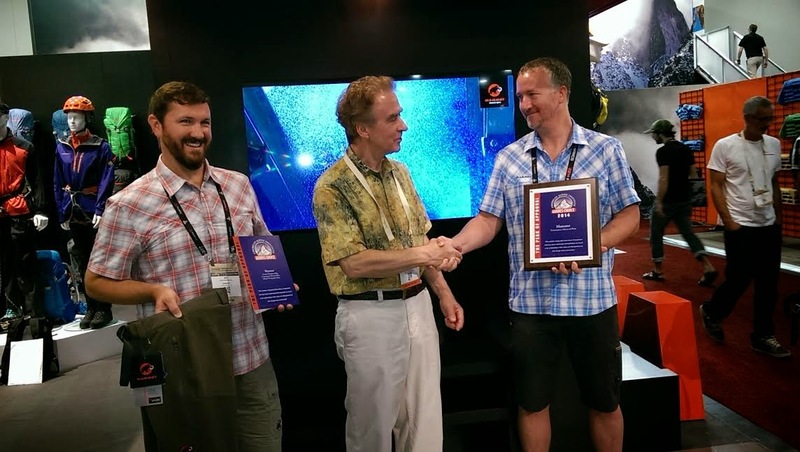 Mammut's Territory Manager, Jeff Krahenbuhl (Left) and Sales Representative Kendall Dewey (Right) during the award ceremony for the Courmayeur Advanced Pant. 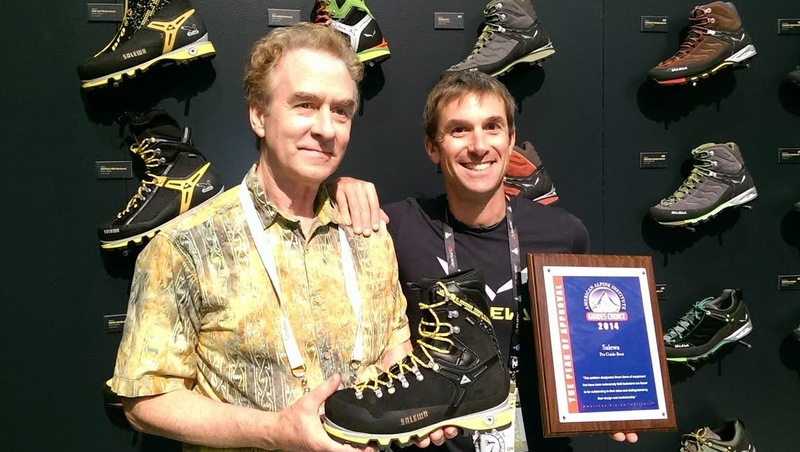 Salewa's Eric Henderson accepting the Guides Choice Award for the Pro Gude boot. 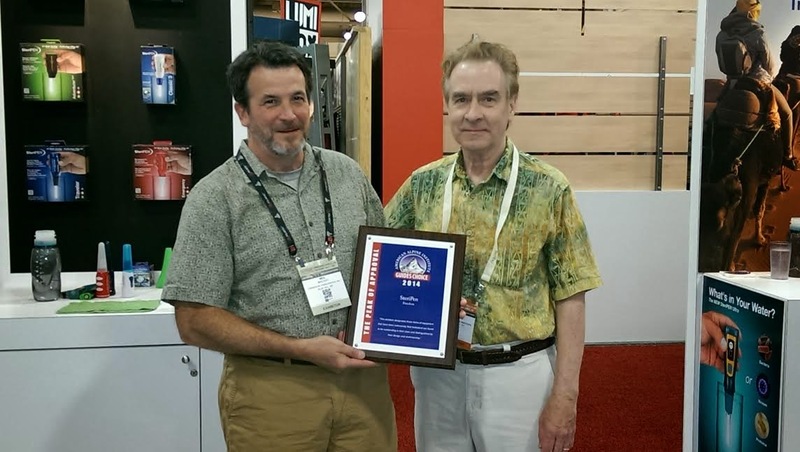 SteriPen President Neil MacKay receiving the Guides Choice Award for the Freedom water purification device. Read more about the 2014 Guides Choice Award winners. OR is a lot more than just buying and selling. 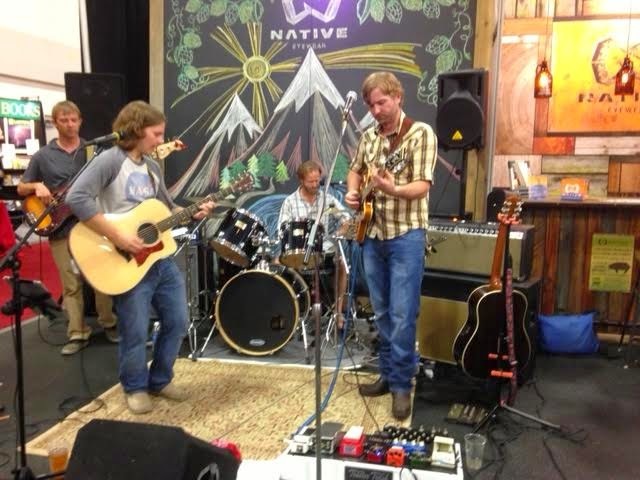 Every year these thousands of outdoor industry professionals use OR as a time to come together to converse, collaborate, and find ways to benefit the consumer and the environment through educational sessions, meetings and the occasional cold beverage. While at OR we use the opportunity as guides to talk to product developers about their existing products and how they can be made better, or even present ideas for new products. On several occasions product improvements have been made based on product development meetings between AAI and company designers. 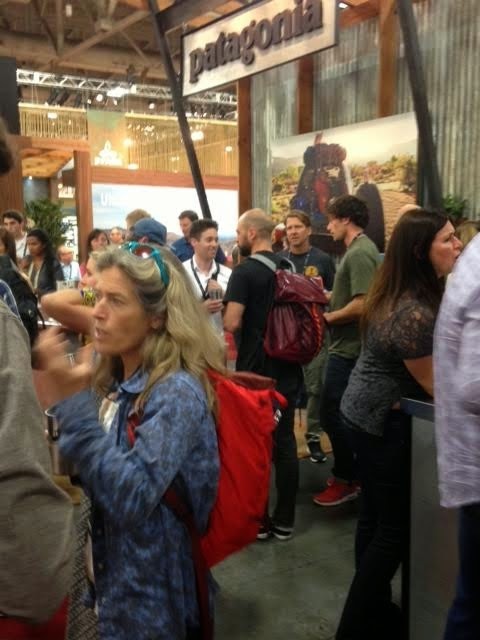 Even the isles at the show are often filled with people and conversation, and they are well sprinkled with outdoor industry notables (here, Lynn Hill in a discussion outside the Patagonia booth). Typical hustle and bustle of the show floor. Around 5:30 each day, business slows and little bands and beer come out. OR is all about the new gear that will be coming to market the following year. Over the course of the show you will always find a few new and intriguing items mixed in with all of the other things that have not been changed. Here are just a few of the cooler things that we were shown. CAMP's new assisted braking belay device the Matic features very smooth rope feeding and has a clutch that locks the device off if the belayer pulls the lowering lever too far back. This safety feature helps to eliminate the potential of a climber being dropped if the belayer panics and pulls back too far on the device. 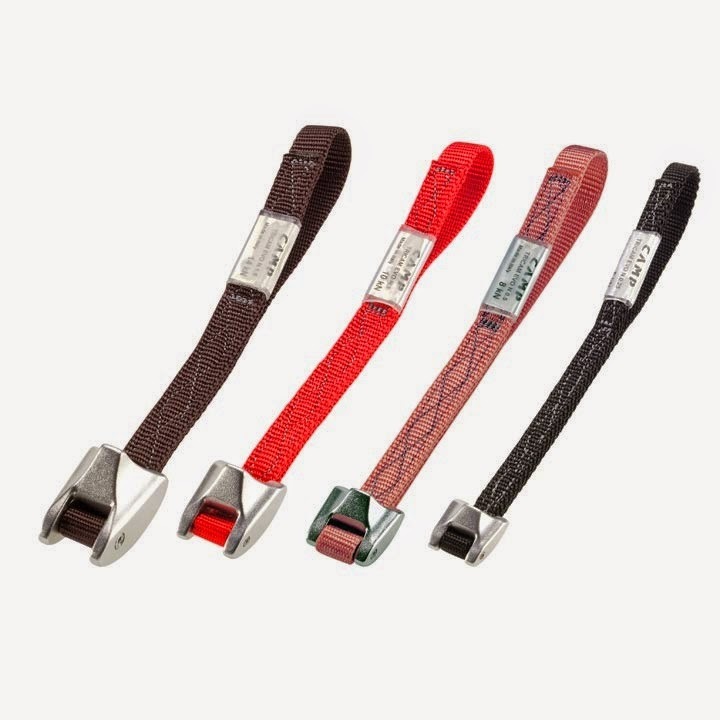 The Matic is equipped with a soft grabbing stainless steel rope cam. When loaded suddenly a small amount of rope is allowed to slip through as the cam starts to pinch the rope. This reduces impact forces on your anchors and allows for a softer catch as well. The Matic should be available spring of 2015. 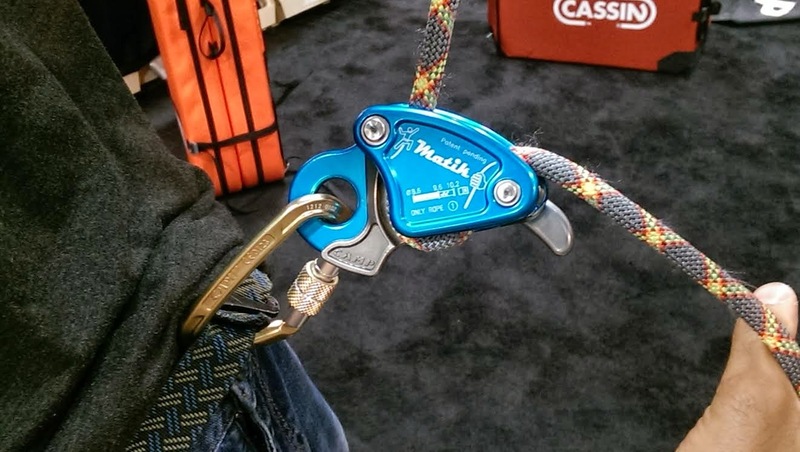 The CAMP Matic assisted braking belay device. Every year single rated ropes are getting skinnier and skinnier. 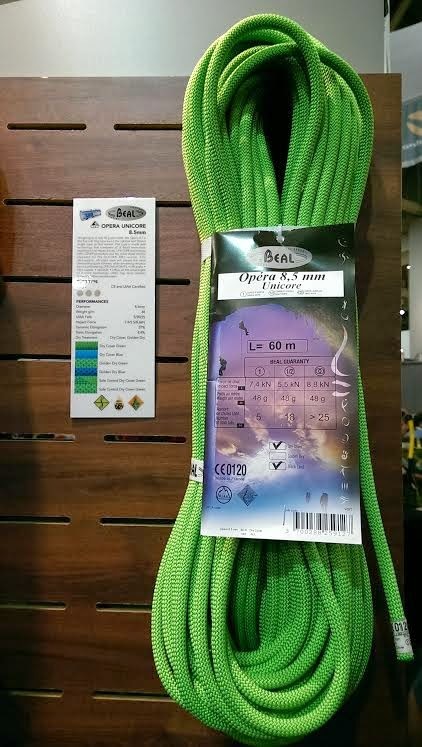 This year Beal debuted their 8.5mm Opera rope. 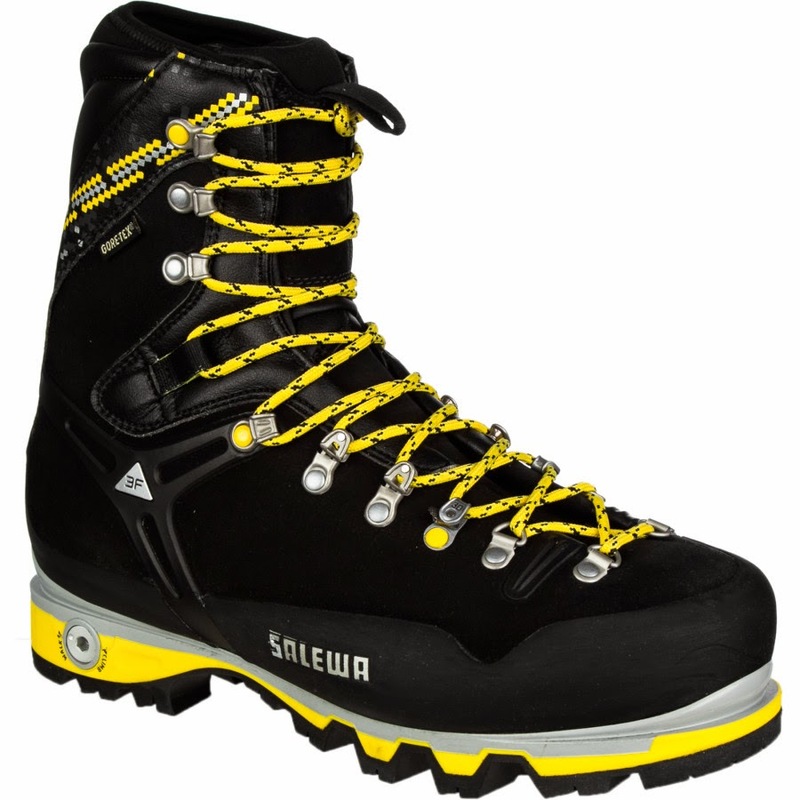 Rated as a single, twin and half rope the Opera is sure to bring versatility to the alpine climbing wold where snow, rock and ice are all likely to be encountered. It is not decided yet but while speaking with Fred Beal at the show, they would like to make it available in 50, 60, 70, 80, 90 and 100 meter lengths! With a 5 fall rating, Unicore technology, and only weighing 48 g / meter the Opera will prove to be a very versatile rope. Julbo is bringing the 80's back thanks to AAI Guide Liz Daley. On a trip to France she requested retro shades with modern technology, and Julbo is delivering. The Cortina is part of their new Heritage Collection. 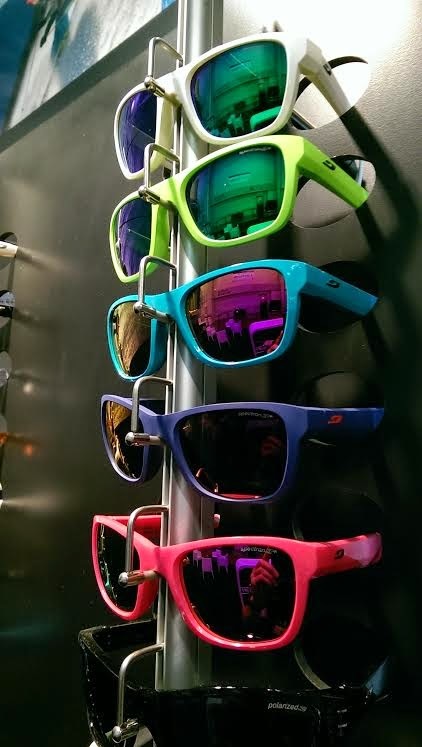 With Spectron 3 lenses and available in a fun variety of colors you can look rad in the backcountry and around town. The Julbo Cortina is bringing back the 80's but with modern technology. Outside of the showroom floor there are endless opportunities to take part in special events, fundraisers and attend some pretty amazing parties. 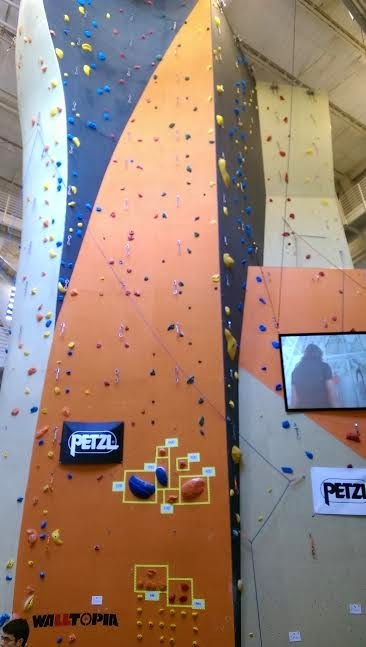 This year myself and Richard received a special invitation to the grand opening of the new Petzl North America location. The facility was specially designed with the environment in mind. It is located within minutes of mass transit, making it very easy for employees to leave their cars at home. 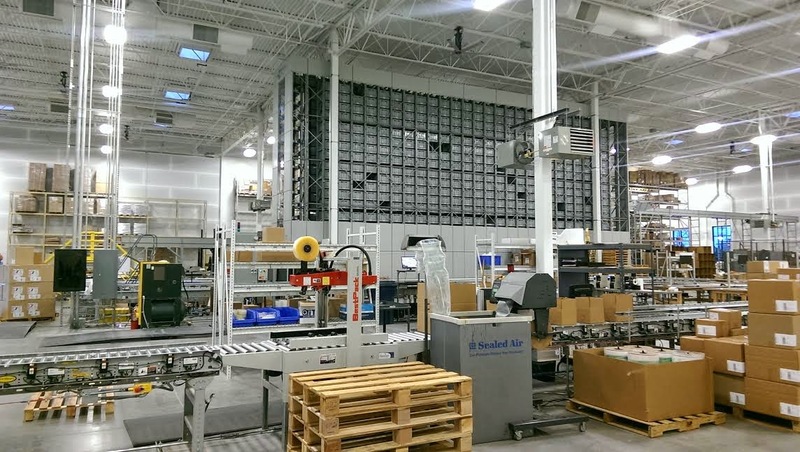 The facility has state of the art energy limiting technology, and approximately 25% of the energy consumption is offset from a solar array located on the new warehouse roof, with the intent to be fully solar run in the coming years. It is obvious walking through the front door as to where you are. 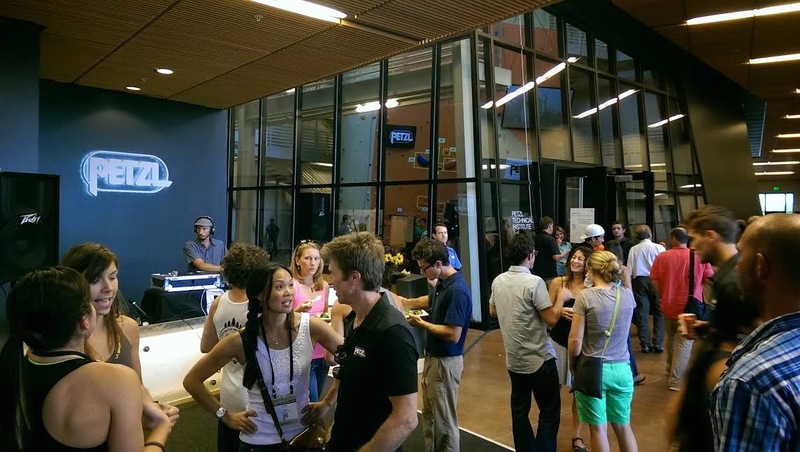 Petzl athletes, employees, key dealers and friends enjoy the wide open and bright atmosphere. 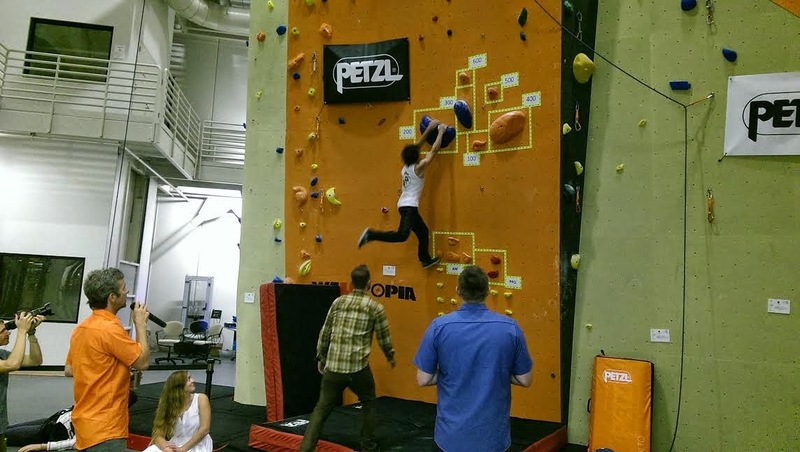 The new facility is home to Utah's tallest climbing wall, standing at 55 feet tall. 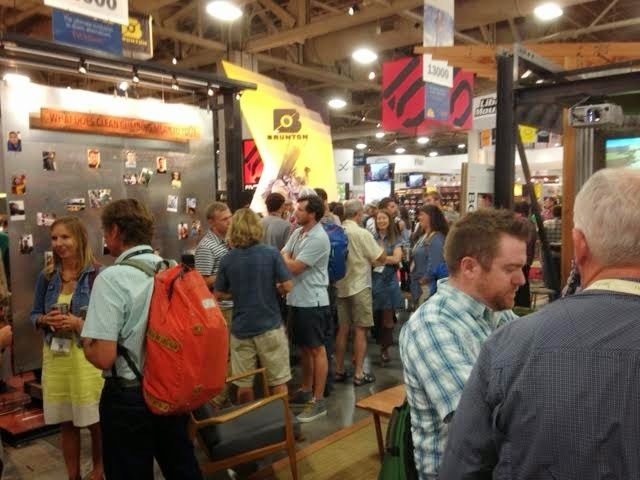 Outdoor Retailer is always a very rewarding experience. From the people that you meet to the new gear the you get to preview, you always come from away from the event super excited for the coming year. Now the countdown begins until next OR. To read about the American Alpine Institute's aid climbing program, click here. 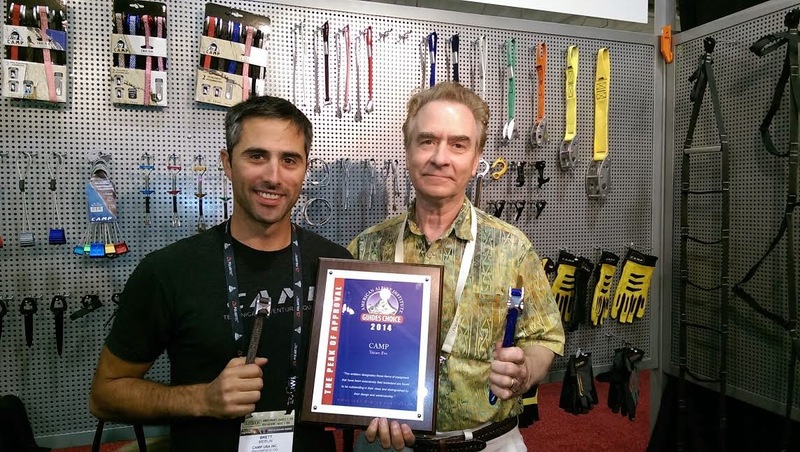 The American Alpine Institute Guides Choice Awards are being announced today at the 2014 Outdoor Retailer Show in Salt Lake City. This years award winners have all been tested by AAI's professional staff and have proven to exceed expectations in performance, durability, and innovation. CAMP’s EVO version of the legendary Tricam has two distinct improvements that make them even more versatile than the originals. The head is now tapered allowing for an additional passive protection mode, much like a standard wired nut. This taper also increases the stability of the added passive placement, making it less prone to wiggling out or walking. The Tricam EVO also has a stiffened sling so that placements can be made holding the Tricam vertically by the sling, like a wired stopper. The additional layer of material used to stiffen the sling also adds durability to the Tricam increasing your sense of security when used around sharper edges. Anyone who has used Tricams knows that they have a great range of crack sizes that they can be used in and that they are lightweight. We particularly like them in horizontal placements where a fall would most likely bend the stem of a camming unit and where regular stoppers are just a pain to place. The Tricam EVO works wonders from the wavering and pin scarred alpine cracks of the Cascades to splitter horizontal cracks of the Gunks. Many of our guides have come accustomed to carrying the 0.5 - 1.5 sizes on almost all of their rock climbs. 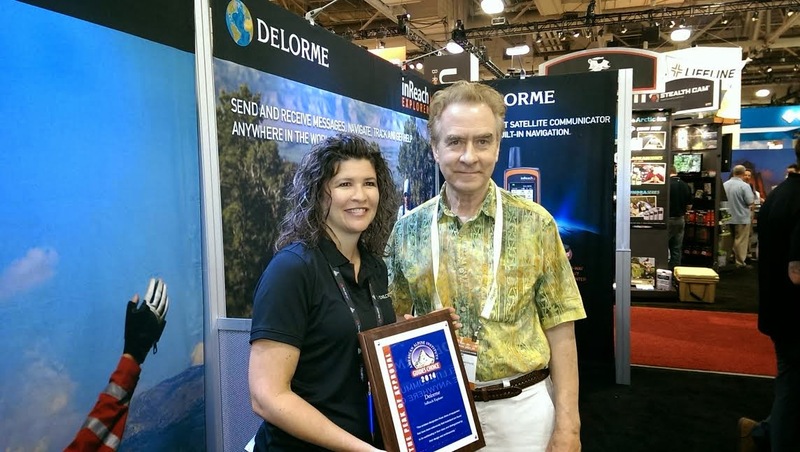 The Delorme inReach Explorer is the newest two-way, satellite texting and SOS device to hit the market. What sets the Explorer apart from other locating and communication beacons is that it also has built in GPS navigation features. Our gear testers found this combination of navigation and communication to be a great benefit when traveling in difficult and remote regions of the world. The added GPS navigation functionality was great for pre-trip planning. The ability to pre-set waypoints and routes using Delorme’s online map planning tools was quick and easy. While our guides are in the field our support staff can locate them, and see where they intend to go while they are following a planned route simply by checking their MapShare page. The main benefit that the inReach offers is two-way texting. Unlike other personal locator beacons the inReach allows you to compose messages and get replies in the field rather than picking from a few preset ones and then not being able to get a reply. Messages can also be sent from one inReach to another allowing multiple parties in the backcountry to stay in touch with each other. By downloading the Earthmate app to your smartphone and Bluetooth pairing it to the Explorer, sending text messages and viewing maps is incredibly easy. Because the inReach uses the Iridium Satellite Constellation, it acquires a satellite fix quickly and offers truly global coverage without dead-zones or down-times that other carrier constellations are plagued with. Messages that were sent to or from the inReach were delivered very quickly, usually in less than one minute. Because every message that is sent from the inReach has your location attached to it, recipients can always keep tabs on you as you travel. The inReach really allows for quick and easy communication during non-emergency situations, but still offers the SOS option in which search and rescue can be summoned to your location with the push of a button. After an SOS has been initiated, emergency responders can communicate with you via text messages to learn the specifics of your emergency. 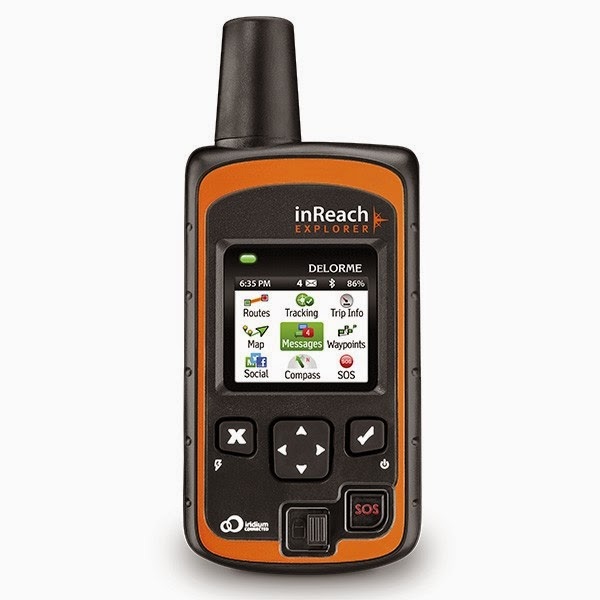 The inReach Explorer is the ideal satellite communication device for any recreationalist that ventures beyond cell phone range. When it comes to softshell pants for alpine climbing there are several requirements that need to be met. They need to be comfortable, durable and seasonally versatile. The Mammut Courmayeur Advanced pant exhibit all of these qualities very well. Constructed from Schoeller Dryskin with 3XDRY technology, the Courmayeur has exceptional breathability and quickly transfers perspiration from the inside of the garment to the outside. The exterior of the Courmayeur is very water repellent and sheds snow or a light rain well and dries quickly in the event that they do become wet. One unique technology that the Courmayeur has is the application of Coldblack. This application is applied to the fabric and prevents the absorption of UV light, keeping the fabric cool to the touch. Coldblack made the Courmayeurs noticeably cooler on a bright sunny day on the glacier, even when wearing the black colored ones. 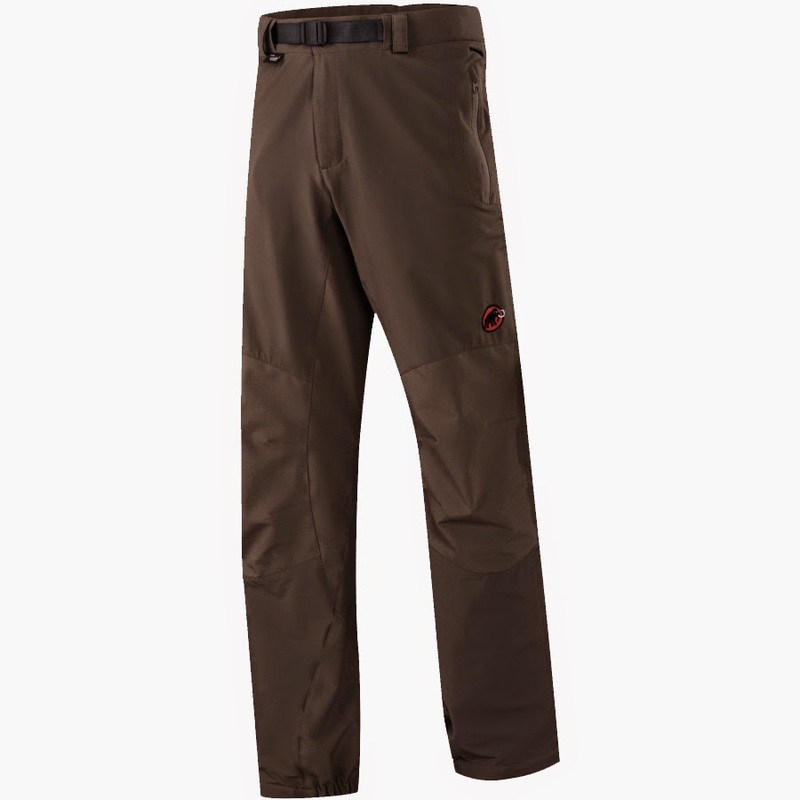 The Courmayeur Advanced pants can also take a beating and just keep going. High wear areas like the knees, rear and cuffs are reinforced with a durable ripstop material. Despite AAI guides using them for many days in a row, on ice, snow and rock, they still look quite new, and will hold up to many years of use and abuse. Many of our guides climb snow and rock in the summer, and climb ice and ski in the winter. The last thing they wanted was to have several pairs of softshell pants to fit all of the activities they would be doing. The Courmayeur did fantastic for year-round use no matter the type of activity. Compared to chemical purification methods, the use of UV light to rid water of bacteria, viruses and other water-borne pathogens leaves no taste, is not harmful to your kidneys if needing to purify water over long periods of time, and is over 99.99% effective when used properly. 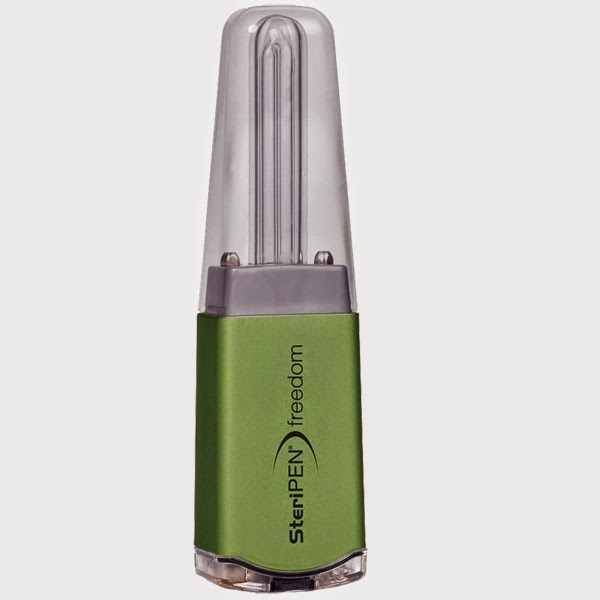 The SteriPen Freedom offers a lightweight chemical-free way to purify water when in the backcountry or traveling abroad. The Freedom has several great features that our guides liked. The first is the size. At a little more than 5 inches long and only 2.6 ounces, the Freedom is the smallest and lightest SteriPen offered. It can easily be carried in a shirt pocket, or slipped into the lid of your pack to be at the ready. Another feature that our guides particularly liked was the USB rechargeability of the Freedom. On longer trips our guides used a solar panel to ensure the battery is always topped off and was never any worry about running out of juice to purify water. On a full charge you can expect to get around twenty 1 liter treatments, or forty ½ liter treatments. We put the Freedom to test in Bolivia where water quality can be less than ideal due to contamination from llamas and other pack type animals. Despite three weeks of exposure to this iffy water, no water-borne illnesses were developed thanks to the SteriPen Freedom.